As anyone who follows The Queen's jewelry knows, her favorite earrings for daytime are a classic combination of diamond and pearl. She has a few variations on this combination in her collection, including a pair of earrings with round diamonds above pearl pendants. These earrings were most notably worn by The Queen for the big celebration of her Silver Jubilee in 1977 (hence the name I'm using to identify them), when they were paired with her pink Hardy Amies outfit and famous Simone Mirman flower hat. Though the design is along the same lines as her favorites and she wore them in 1995*, this pair of earrings did not make it into the regular rotation. They have remained primarily associated with the Silver Jubilee era. They're not worn publicly by The Queen today, but this pair of earrings has made it into the group of jewels that she loans to family members. In 2012, while visiting Luxembourg for the wedding of the Hereditary Grand Duke, The Countess of Wessex wore what appeared to be the same pair of earrings. During the same trip, she also wore the Five Aquamarine Tiara and the King Faisal Diamond Necklace for the first time, both on loan from The Queen, so we know at least some jewel loaning occurred in advance. The similarity and possibility of an earring loan was noticed by Anna from the Countess of Wessex blog. In 2016 in Canada The Duchess of Cambridge also wore these earrings. 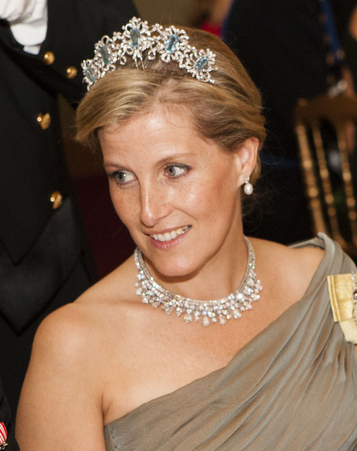 This is a common design - as demonstrated by the Heavenly Necklaces company initially appearing to identify the earrings as their own make - but when they were worn again by The Duchess of Cambridge on a visit to the Netherlands, it was confirmed by the palace that the earrings had been loaned to her by The Queen (thanks to Anna's original hunch). The Duchess has since worn them for several occasions (appearances of which I have decided not to list here at this time). *With thanks to Baxter in the comments!